A few weeks ago I wrote a post asking for some advice about what to make with plastic hangers. I got some great suggestions on Facebook and on Tinkerlab's Forum. Several people suggested making a mobile so I thought I would give it a try. 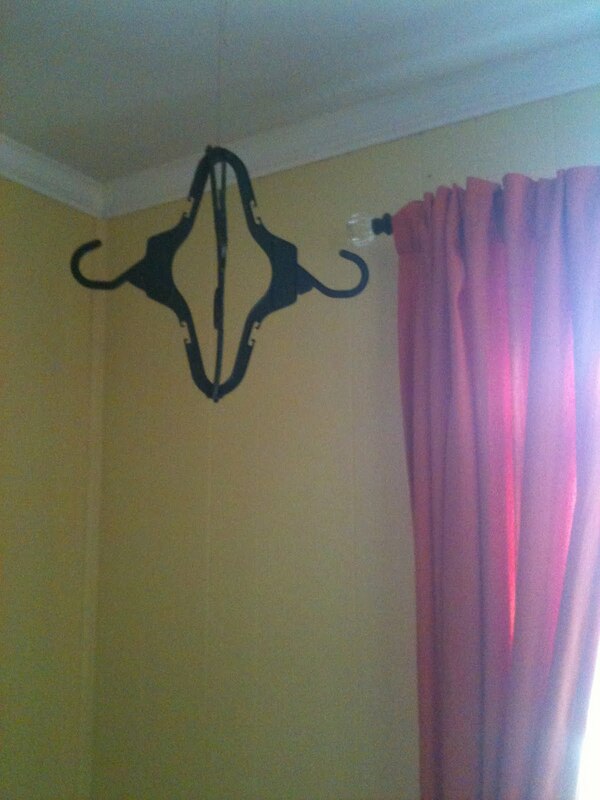 I begin by taking plastic child's hangers left over from some Fall/School shopping. Using a hot glue gun I attached the hangers end to end. 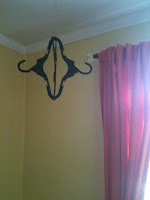 Once the glue was dry, I took the hangers outside and spray painted them with regular black spray paint. 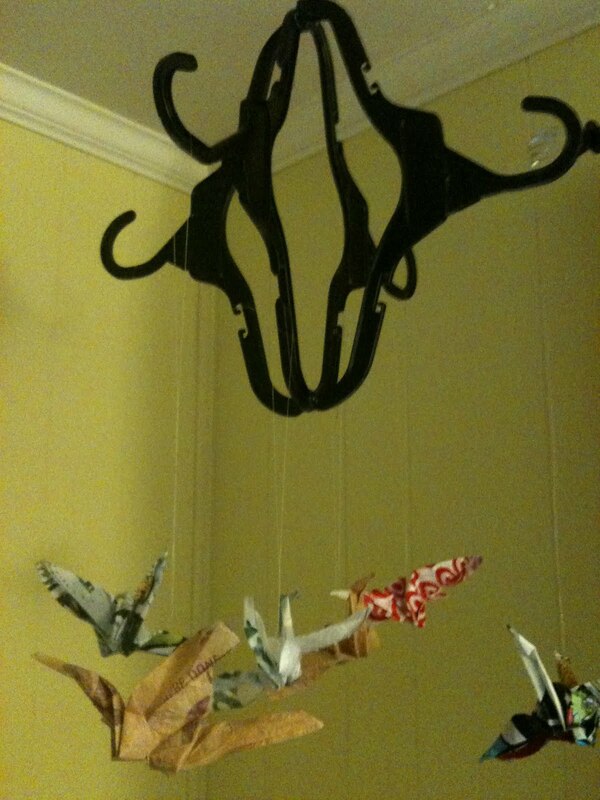 Then using fishing line and a thumbtack I hung the hangers down from the ceiling. After seeing a paper crane mobile a few months ago I have been wanting to make one for our play area, but I thought for this mobile I would stick with the plastic theme and make the cranes out of fused plastic. If you have never fused plastic it is a very easy and fun process. To fuse plastic you need to take several plastic bags and cut then into squares. You then want to layer 2-3 pieces of plastic together and sandwich it between to pieces of thin fabric, like a muslin. Using a hot iron, iron the fabric, constantly moving the iron until the plastic begins to melt together to create one piece, about a minute. One not about fusing plastic, it is probably not very good for you, the fumes can be a little much, so i recomend doing it in an area with good ventilation and probably just a little bit at a time. After making several sheets of fused plastic, I traced several squares of paper onto the plastic sheets in order to cut out even swaure of plastic. 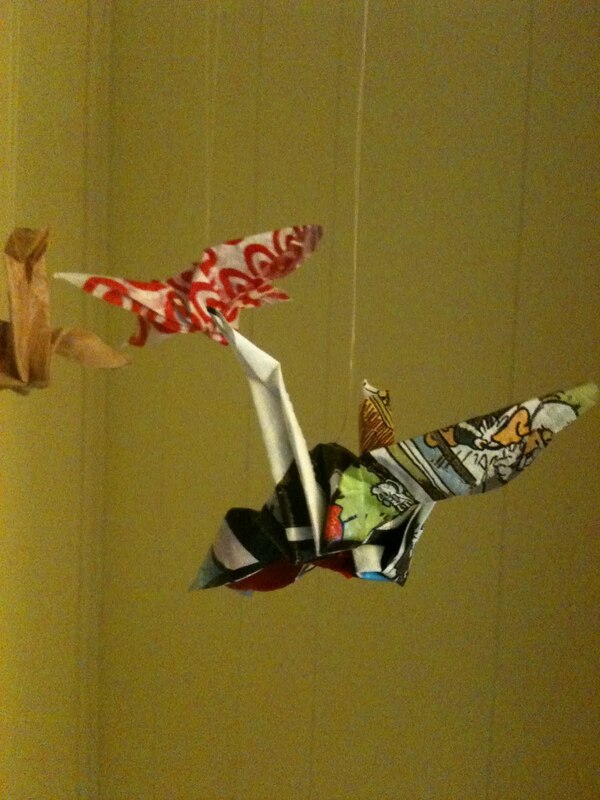 I then folded the plastic into oragami cranes as you would with paper. The plastic is a little harder to crease but for the most part it works just like paper. If you have never made an oragami crane, it is one of those things that took me a few time to figure out but after a few tries it becomes very easy. There are loads of youtube videoe and other tutorials online but here is one I liked: http://www.youtube.com/watch?v=YSTjk8ElGhQ&feature=fvst. 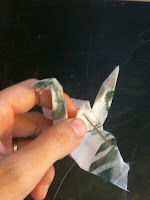 After makeing 6 fused plastic cranes I then threaded a needle with fishing line and put the needle through the plastic at the top of each crane, creating a loop that i used to hang the crane from the plastic hanger mobile. I love that this mobile is entirely made out of upcycled plastic and looks great in our playarea. I also like the possibilities of the mobile, I could easily take the cranes off and replace them with photos or other objects.